The crunchy, buttery and crisp butterscotch cookies are not so difficult to make. 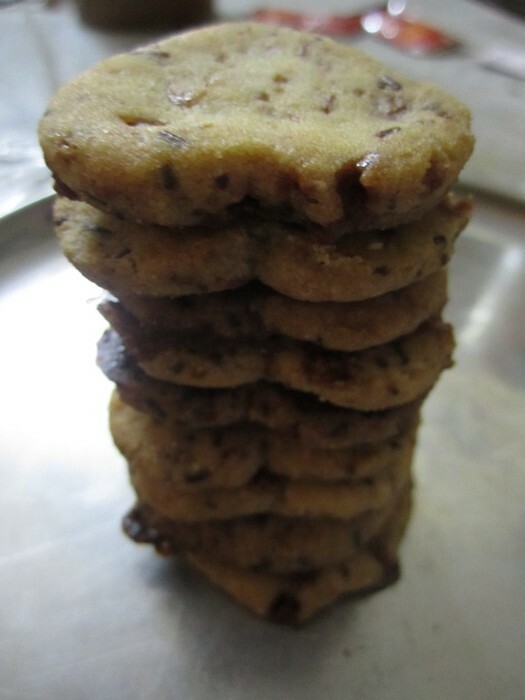 One needs to take so much care though, while baking these. A minute extra would mean that the butterscotch is melting off and caramelizing which would destroy the taste of the cookies. 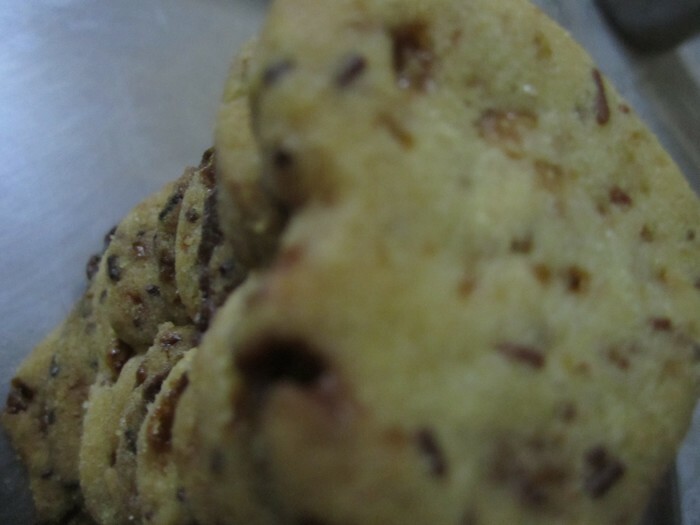 My batch of cookies are also a bit over done (mostly a minute of extra baking) but we loved that crunchiness so much. I let it brown on purpose as I like the caramelized flavour. If you dont want your cookies to look like mine, take them off a bit early. Beat the butter and sugar in a vessel until it becomes a soft paste. Mix the dry ingredients of flour, salt, corn flour in a bowl. Mix the flour with the butter mix and knead slowly. Add butterscotch powder and toffee bits. The mixture would be falling apart and this should be correct consistency. Bring it close together to form a ball, warp it in cling film. Refrigerate for an hour so that the dough becomes workable. Roll/Press out a circle shape using your palms and if required cut to desired shapes. Line the baking tray with parchment paper or grease some oil/butter. Cook them on the rack for 10-15 mins and then remove them to store in an air tight container. Note: Touching or trying to remove the cookies as soon as taking them out. They would be very soft and need resting time to become hard. Wow can’t wait to try these !!! But i guess would have to wait till going back to India..you know the Japanese microwave/oven and all 🙂 On a second thought would pressure cooker work for this too…he he he… 😉 Thanks !! Haiyoo.. are they not good enough?